In the late 1800s, “Arctic Fever” swept across the nation as dozens of American expeditions sailed north to the Arctic to find a sea route to Asia and, ultimately, to stand at the North Pole. Few of these missions were successful, and many men lost their lives en route. Yet failure did little to dampen the enthusiasm of new explorers or the crowds at home that cheered them on. Arctic exploration, Michael F. Robinson argues, was an activity that unfolded in America as much as it did in the wintry hinterland. Paying particular attention to the perils facing explorers at home, The Coldest Crucible examines their struggles to build support for the expeditions before departure, defend their claims upon their return, and cast themselves as men worthy of the nation’s full attention. 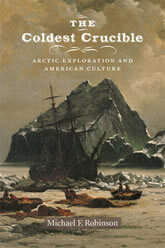 In so doing, this book paints a new portrait of polar voyagers, one that removes them from the icy backdrop of the Arctic and sets them within the tempests of American cultural life. With chronological chapters featuring emblematic Arctic explorers—including Elisha Kent Kane, Charles Hall, and Robert Peary—The Coldest Crucible reveals why the North Pole, a region so geographically removed from Americans, became an iconic destination for discovery.